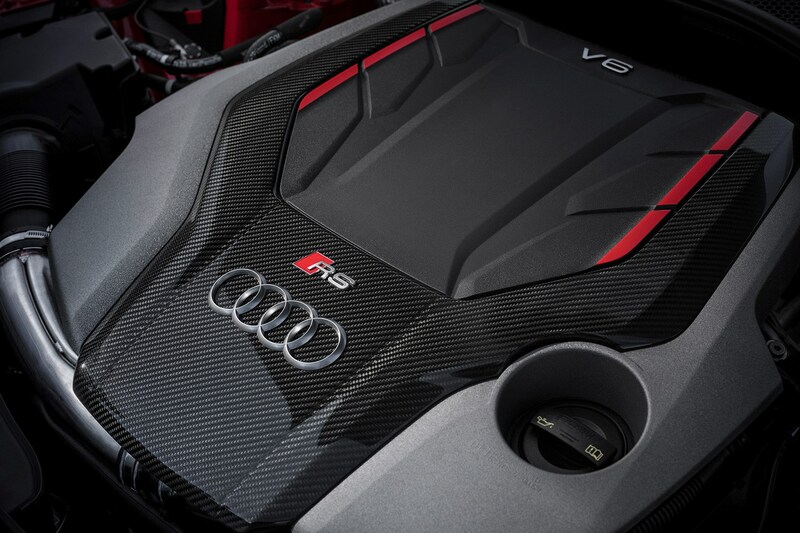 ‘An athlete in a tailor-made suit’; that’s what the RS 5 is, according to Audi. 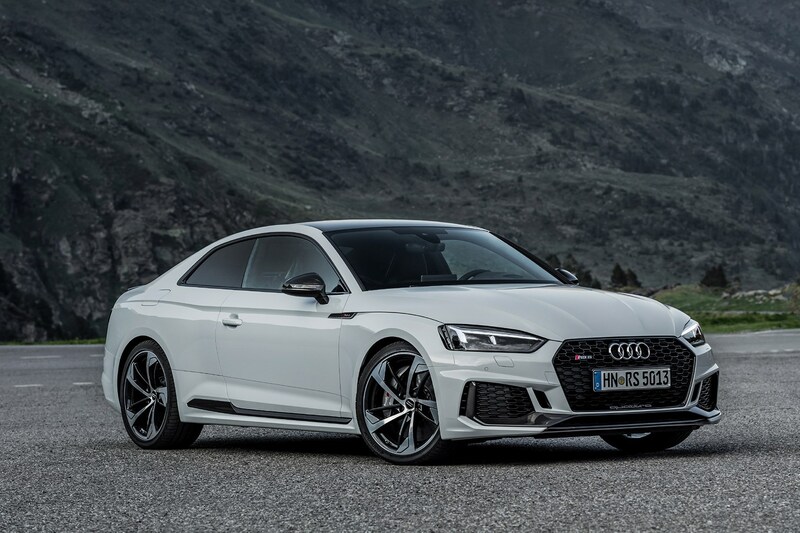 While the previous model had an oversized turbo-free 4.2-litre, eight-cylinder engine – which produced a spine-tingling yowl when worked hard – the new model gains a shrunken 2.9-litre six-cylinder with two turbos for added muscle. 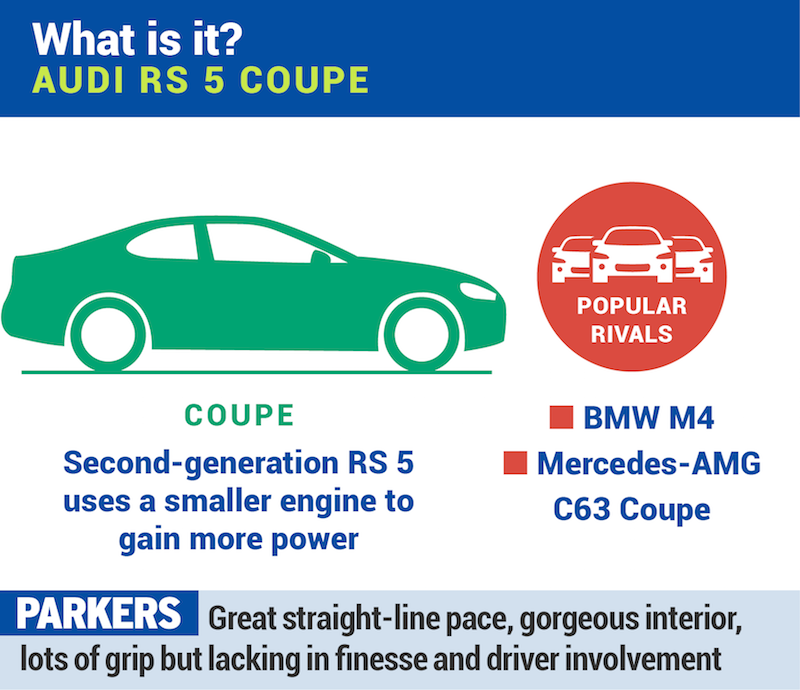 That puts it head to head with the BMW M4 and Mercedes-AMG C63 Coupe, with more power than the BMW and less weight than the Mercedes. 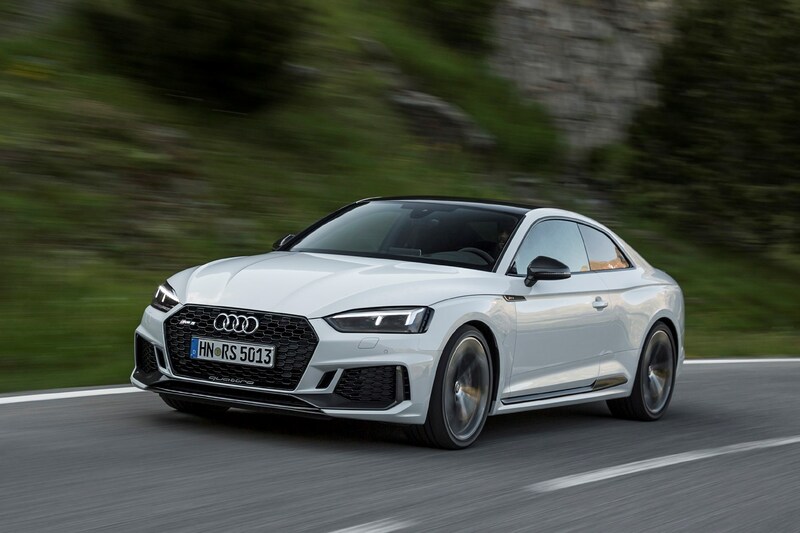 With a hefty 450hp on tap and 60kg less than before to haul around, Audi describes this model as a rapid, agile long-distance cruiser, capable of smashing through the 62mph mark in just 3.9 seconds. Along with the smaller engine, you also get less in the gearbox department with a conventional eight-speed automatic unit compared with the fast-shifting twin-clutch version in the previous model. 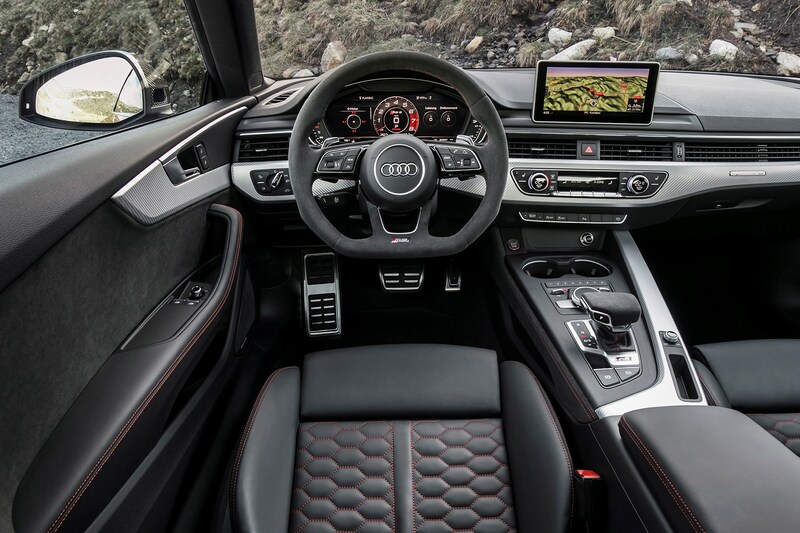 Audi claims that it has improved this ‘box for quicker reflexes with short lower gears, helping drivers make full use of the engine without having to drive at illegal speeds. The motor may be smaller, but it produces much greater punch at low engine speeds than before; even in a high gear the RS 5 rockets away with the slightest stab on the throttle. Venture into a lower gear, though, and this Audi bends the speedometer around as if it were in freefall. Unlike some automatics, the gearbox has a full manual mode which won’t change down a gear – however hard you mash the throttle – without your instruction and won’t change up unless you pull the steering wheel-mounted paddle. It’s similarly slick when left to its own devices – especially when dawdling – though it can take a second to shift down several gears if you need to accelerate suddenly. The 2.9-litre engine sounds menacing when worked hard, all the more when you select the Dynamic drive mode, though it lacks the savage engine note of the old car and is surprisingly quiet for a machine so fast. What is the Audi RS 5 like to drive? Specify adaptive suspension and you can tweak suspension firmness along with gearbox response and steering weight in the RS 5. Comfort, Auto and Dynamic modes are available alongside an individual setting, where you can pick and mix your desired settings; softer suspension and a sharper engine response, for instance. 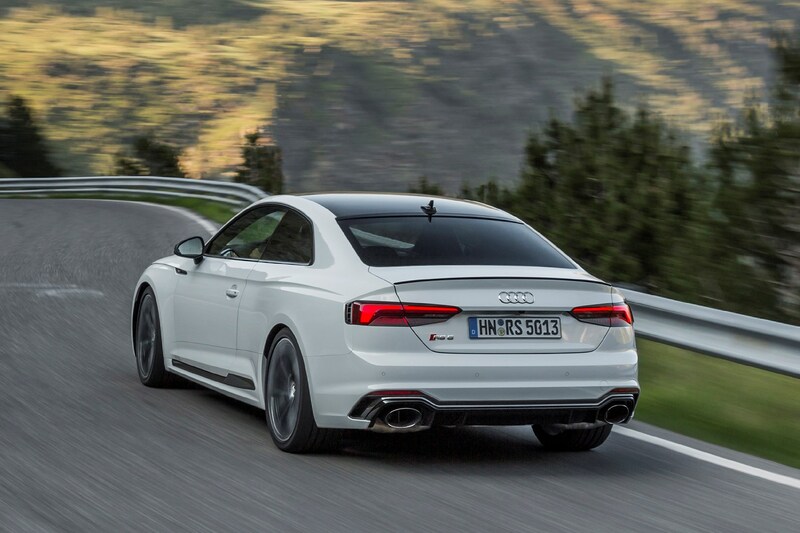 Despite 20-inch wheels being fitted to our test cars, the RS 5 soaks up problem tarmac without fuss. Comfort is somewhat soft, with the car feeling like it’s floating over undulations, while Auto makes it feel a little more planted. Switch to Dynamic and the firmness is dialled up again. Though only a sliver of rubber separates the car from the road, the RS5 is mostly impressively comfortable. Corrugated road surfaces do make themselves more obvious when in Dynamic mode, though the car still pitches into corners slightly if you go in fast. 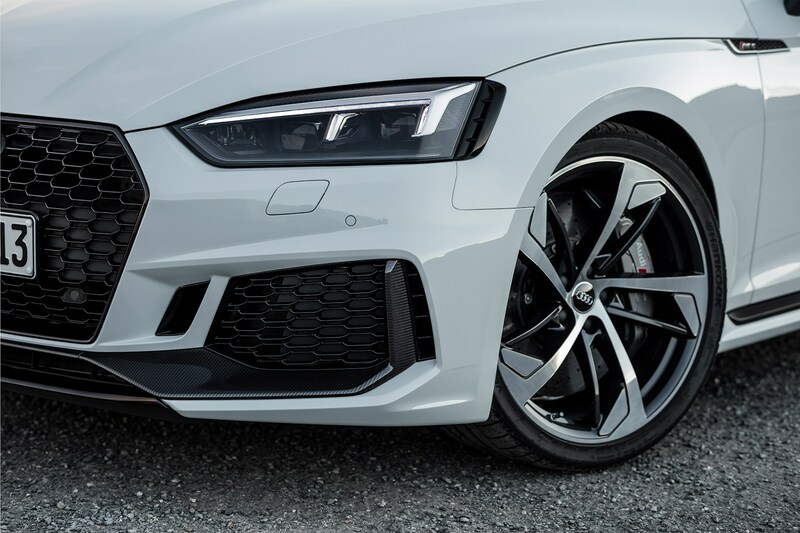 With power being dished out to all four wheels, the RS 5 feels stable and controlled in bends, but you can feel the car’s weight when negotiating turns at speed. Push too hard and the super-cautious stability control kicks in, causing the front tyres to run wide, making the RS 5 feel lead-footed. Select the Sport setting, though, and the system lets the back of the car slide a little, making for a much more exciting drive. The steering is weighty and direct, giving a good sense of how much grip the front tyres have. The standard brakes are similarly confidence inspiring and even more mighty ceramic brakes are available at extra cost. The engine is near silent when cruising and not too loud even when worked hard. 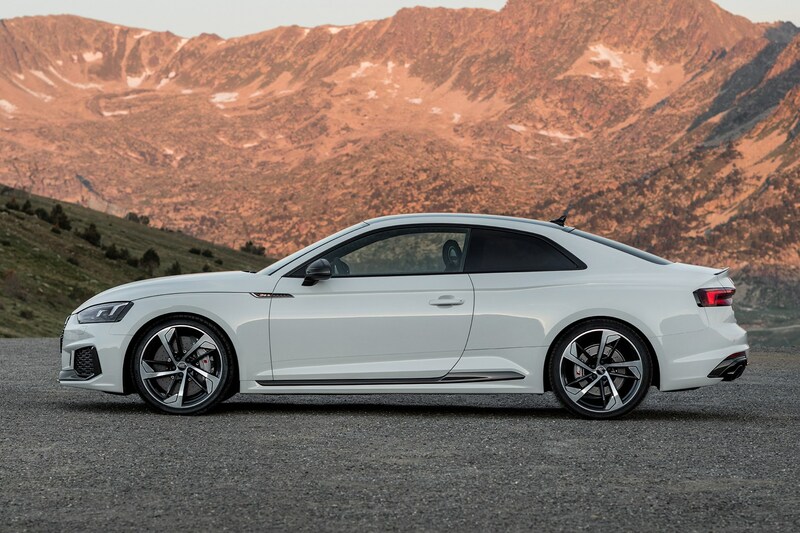 Throw in barely any wind, road or tyre noise and the RS 5 lives up to its £63,000+ price tag. That’s even truer in the upmarket cabin which features luxurious, tactile materials such as the soft leather of the body-grasping sports seats and slick tech of the intuitive sat-nav system, plus glitzy digital dials that can show several displays including an oversized sat-nav map where the speedometer would normally be. Big power, sharper reflexes and improved comfort make the RS 5 a supreme athlete; a straight-line sprinter. The posh cabin gives it a tailor-made feel, too; very welcome in a car so pricey. This is not as sharp a sports car as the BMW M4, but it has a superior interior and brutish but somewhat classy looks to outclass the Mercedes-AMG C63 Coupe. 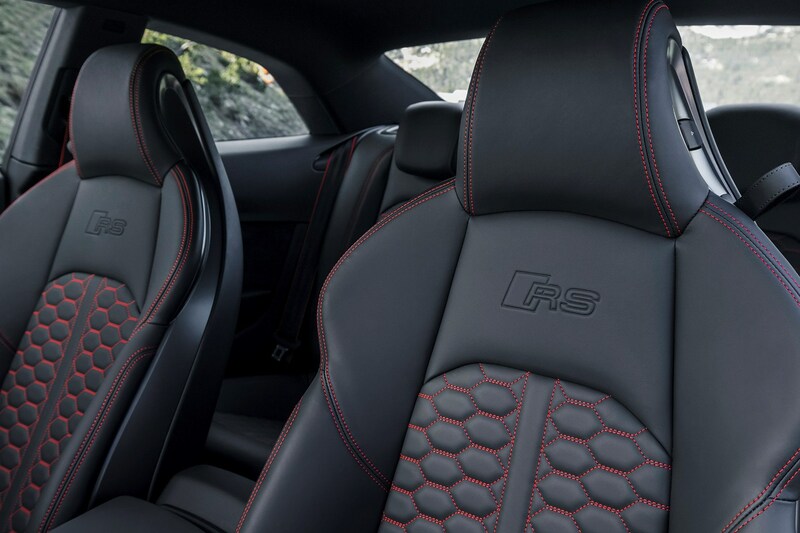 Throw in all-wheel drive for all-season ease of driving and the RS 5 is an appealing prospect.